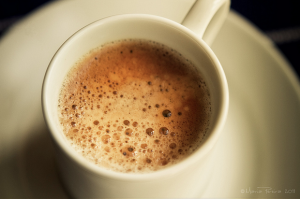 For some of us, having a fresh cup of coffee at home is a necessity, and we need it to start the day – emphasis on the NEED. As a coffee drinker, once you discover that having your own coffee grinder (so you can grind your coffee beans fresh) makes all the difference in the taste of your home brew, you can really start to enjoy the results instead of just hitting “brew” and hoping for the best. Once you start truly making great coffee at home, you can slowly ween yourself off spending a ton of money at your local upscale coffee joint and enjoy home brewing to its fullest potential. Oh yeah, that’s what we’re talkin’ about – brewing noticeably better-tasting coffee while saving money at the same time. You’re going to need a coffee maker. Sure, there’s nothing wrong with the Keurig K45 on the right here, which does a variety of different coffee flavors via K Cups and makes a decent cup of coffee in a pinch. But…its just not the same as if the coffee beans were ground fresh with your own grinder. 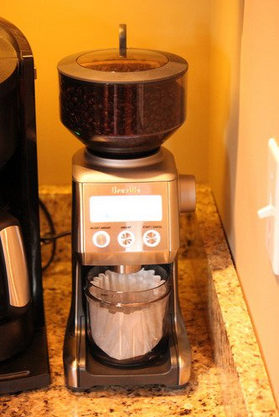 Its a good machine, but if you’re using pre-ground coffee, you can definitely do better. 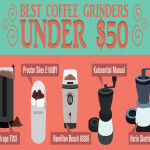 So really, what’s the big deal about owning a grinder in addition to a coffee maker? Well, you’ll get a fresher grind, with better and truer flavor, and isn’t that what coffee is all about? You really have to experience home ground coffee beans to understand how much better your coffee will taste. Like we always say around here, if you don’t use a coffee grinder, you may as well be drinking coffee out of a hubcap. Drink Fresher Coffee, Grind The Beans Yourself! 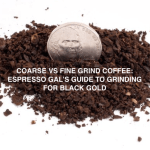 If you’re going to invest in a grinder, you’ve got to do better than OK – you really need to have a great one if you really want to notice a difference in the taste. The Breville Smart Grinder on the left here is a good example, but its going to cost you probably upwards of $200 on its own. So where does that leave you? To make really amazing coffee, you have to have a coffee maker of some kind, as well as a coffee grinder to maximize results. 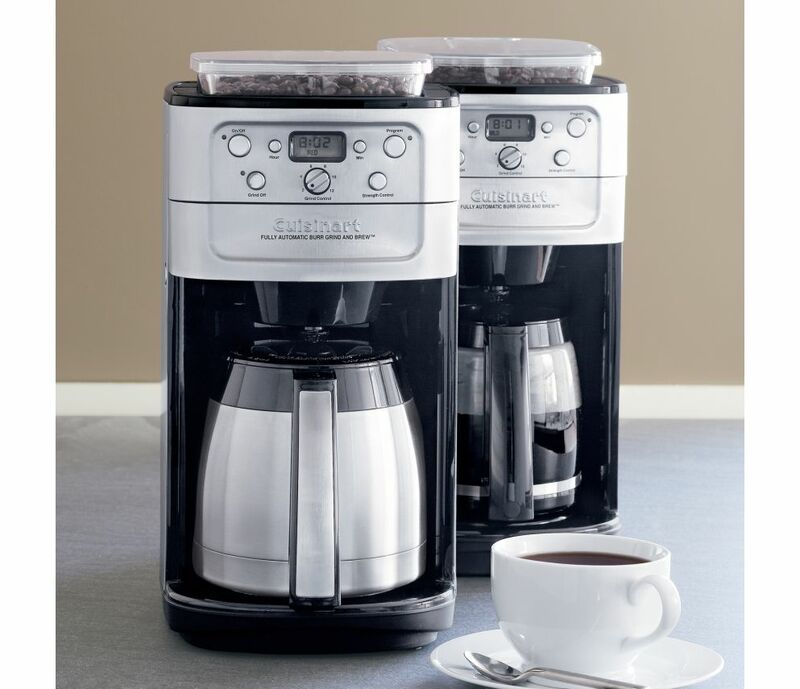 Sooo… that’s one coffee maker, and one coffee grinder you’re going to need. Two mini appliances that can add up in price. Welcome to the future! No, we don’t have flying cars yet, but we do have coffee maker grinder combo units, and we also have this crazy thing flying around! 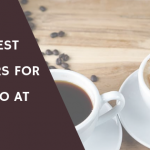 While having both a coffee maker and a coffee grinder sitting side by side on your counter could be considered the ideal situation, as they do look pretty cool together, there are two reasons why you might want to do it a bit differently. Buying both might just break your bank account if you’re not careful, and that means your kids won’t get to go to college or maybe your cat will have to downscale to no name cat food. The second reason we can think of is time. That’s right. It takes a bit more time to use both a coffee grinder followed by a coffee maker. It may be time well spent, but it may also be time you don’t have. Some of us have places to be, ASAP! But maybe owning a coffee maker grinder combo causes you a bit of stress just thinking about it. 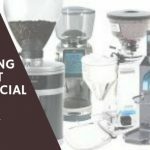 As far as coffee machines with the grinder built in go, we believe that there are a few select models that really got it right, and we want to share them with you here, because not only will they give you the freshness and flavor you want, but they are fast and efficient and well-made. If you’re looking for maximum grind freshness, and a great time saver to boot, it really doesn’t get any better than one of these two-in-one units right here. Kudos to the folks at Cuisinart, who really did a great job here with one of the best coffee machines with grinders built-in there is. Of our two favorites we list here, this one would probably end up on the desert island with us, should we be forced to choose. 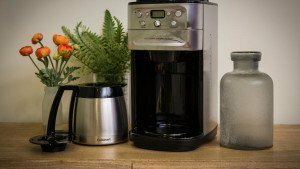 This unit really couldn’t be much more convenient or effective, brought to you by the fine folks at Cuisinart, a trusted name in coffee and with much-beloved favorite of ours as well as many other home-brewing coffee buffs. As the video mentions, the Cuisinart DGB-900BC Grind & Brew is chock full of useful features. For starters, the hopper on this unit holds a half pound of whole beans, which is enough to produce twelve cups of coffee. We think this is a decent amount, if you are entertaining coffee-loving guests, it really does the trick! 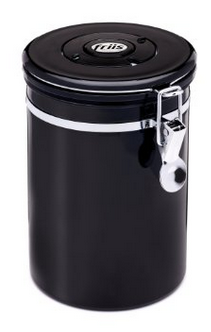 Once you’ve loaded the beans into the hopper, there is a plastic lid which you should use that is airtight. This isn’t an excuse to leave your beans in the hopper for days and days, but what this is perfect for is if you want to wake up to fresh coffee. You can actually program the machine to do that, and the airtight hopper will keep your beans fresh overnight, at which point the programming feature kicks in and the machine begins the relatively short process of making you your coffee. So when you wake up, coffee’s ready! The airtight lid on the hopper just goes to show that Cuisinart is looking out for your coffee’s freshness, since oxidation begins to take its toll on the beans’ freshness the moment the air hits them. Without an airtight lid like this, we need to have something like an airtight coffee vault (the Friis on the left here is a good one). We still don’t like to encourage leaving beans exposed to any air whatsoever, but, to be fair, this the hopper lid with its seal does a pretty good job of preventing air from getting inside the hopper – at least well enough to leave the beans in the hopper overnight. 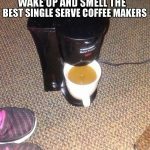 Besides, when you’re in a pinch, and need, for instance, to go to bed and wake up to coffee with not a minute to spare, this added convenience is really one of the Grind & Brew’s secret weapons. Within a 24-hour period, you can get this machine to do your bidding, although the most common use for the programming feature will probably be programming the machine to prepare your morning cup of coffee while you sleep. The controls on the front provide the Grind & Brew with much of its functionality. Here we have the mild, medium, or strong selector button, so that you can control how strong you want your coffee. There is also the control dial for choosing the number of cups of coffee you want made, which goes up to 12. There is the grind-off feature for when you run out of beans, and there is, of course, the ON/OFF button, although this machine has the nice feature of automatically shutting off once its done brewing. 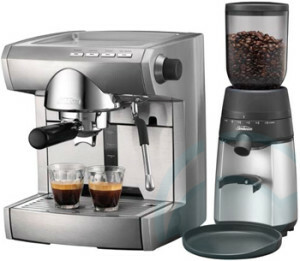 In addition, there is the programming button which allows the machine to do its auto-grinding-and-brewing at any time within a 24-hour period, which we think is the best feature that this machine offers. And then there is the clock, which is a nice touch. So you can see that within this small area on the front of the machine, there is a whole lot of functionality packed in there, to truly customize your coffee making experience. On the back of the Cuisinart Grind & Brew is your water reservoir, where you will add your water (of course), which can be seen through the water level window indicator. 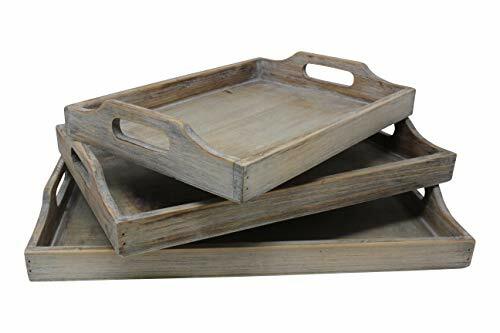 You get a charcoal filter for helping to remove impurities from the water you use, which, by eliminating these impurities, leaves more room for great flavor. So far we haven’t mentioned much about the grinder itself, since there are so many other great features to talk about, but the people at Cuisinart obviously had their head in the game here, as most of the features on this machine check out as convenient and helpful. The double-wall insulated stainless steel thermal carafe is designed to keep the heat in, so once the coffee is brewed, you don’t have to worry about it getting cold between the first cup and the last cup. It will, in fact, keep the coffee piping hot for hours on end, up to 8. 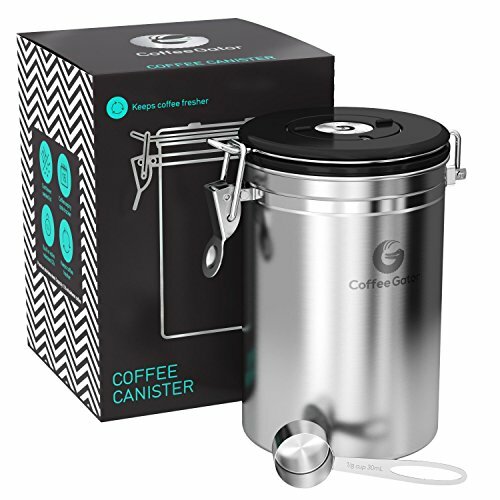 The carafe also has a lid which removes very easy, for easy cleaning, and when you pour the coffee, it opens by itself so there’s no pushing of a handle or button to release the coffee from the carafe. The handle is specifically designed with “comfort grip”, meaning its slightly easier on your hands. This is a small thing, you will notice it and it does make handling the carafe easier. Coffee lovers should also take note that there is a unique “pause” feature on this machine that allows you to get in there and grab a cup of coffee mid-brew, in case you’re making 12 cups of coffee and can’t wait. One thing that we don’t like about this unit is that it only has one grind setting – medium. While this machine does do a lot, a grinder with more grind settings would be more ideal, and so that is our main gripe here. The Cuisinart Grind & Brew also comes with a measuring cup for measuring your beans, and a 3-year warranty in case you have any problems. 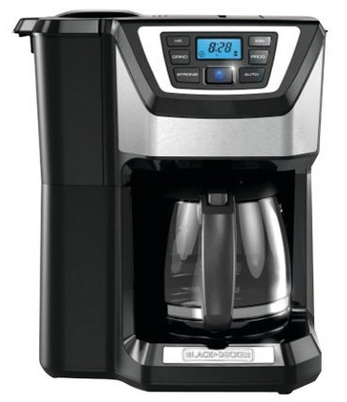 Here’s one more coffee maker with grinder built-in that is excellent and well-reviewed by users. While it is very similar to the Cuisinart Grind & Brew, the Black & Decker CM5000B Mill & Brew coffee maker / grinder combo unit tends to go for a more stylish and sophisticated look, and we agree – it is arguably the more attractive of the two units. The first thing we notice about this unit is its cool blue backlit display that comes on when the machine is in use. While purely for looks, this feature is still quite eye-catching, much like the machine itself, with its more modern appearance. So how does this machine stack up against the Cuisinart Grind & Brew? 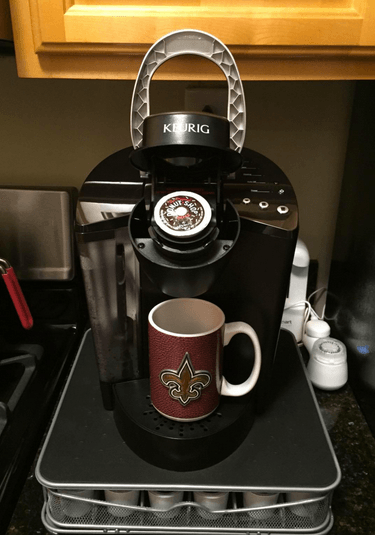 While You Were Sleeping…Coffee Was Brewing! Lets start with how it is similar to the Cuisinart. 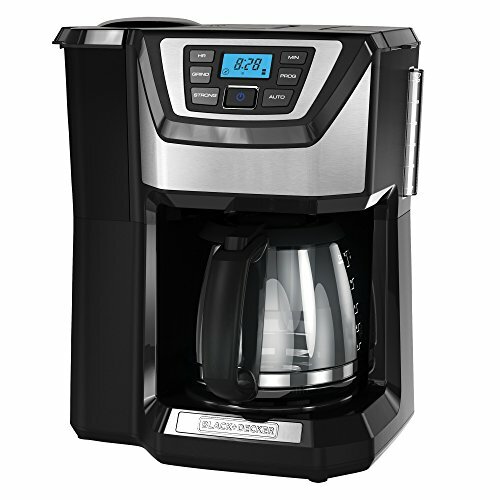 First off, it features the same programmable auto-brewing feature which allows you to wake up to fresh-brewed coffee. As we said, this is a great feature that is one of the main selling points of both machines, and is indispensable if you want coffee for later but have things to do, like sleep. 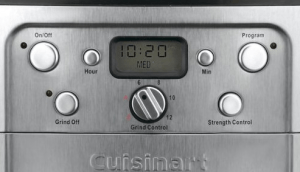 Like the Cuisinart, the programming buttons are in basically the same spot, and do essentially the same jobs. We have the button that controls brew strength, in case you want it milder or stronger. We have a button (rather than a dial as on the Cuisinart) which pre-programs the number of cups of coffee we want to make, which also goes up to 12. We have a setting which allows us to use pre-ground coffee, and the ON/OFF power button, which is very similar to a Macbook’s boot-up button for some reason. Like the Cuisinart, the Black & Decker offers us a permanent coffee filter, but this time instead of gold, its made of bronze. The choice to go with a permanent filter we think is good on many levels, one advantage that the paper filters are wasteful and another being that the paper filters often change the flavor of the coffee. Since these two coffee grinder-makers are essentially very similar, with both being quite easy to clean as well. 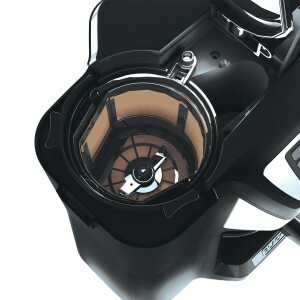 Perhaps there is no need to repeat every single last thing that is virtually identical between the models, right down to the sneak-a-cup feature that allows you to swipe a cup before the brewing cycle is complete. There are a few key differences which we think make the Cuisinart just a little bit better of a machine overall, which we’ll mention now. One big difference is that the Cuisinart is equipped with a burr grinder, while the Black & Decker sports a blade grinder. To a coffee expert, this might be a deal-breaker (blades are inferior to burrs), and yet it reflects in the price difference between the two units, with the Black & Decker being a bit more affordable, generally speaking. 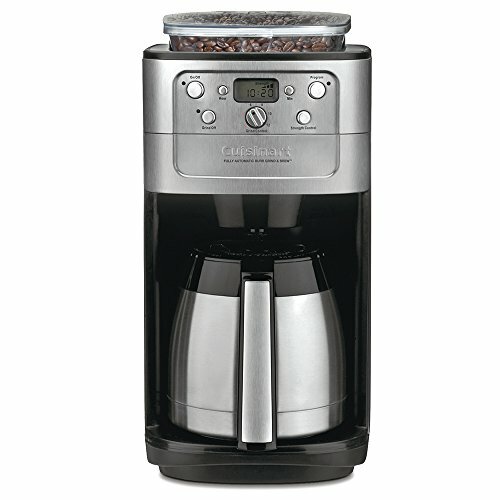 There’s no denying that the Black & Decker is probably the best rated coffee maker with grinder we’ve seen, but the few small nitpicky differences (like the blade grinder built-in) are what makes it lose a bit of favor with us, putting it in the #2 spot behind the Cuisinart Grind & Brew in our eyes. Still, you be the judge. But the differences don’t end with the type of grinding mechanism. When the beans are added to the hopper does not have an airtight seal like the Cuisinart, which keeps the beans fresh overnight. Without that option for keeping the beans fresh, you can’t really walk away from the machine for very long before someone with well-tuned tastebuds will notice that the coffee is stale. This is where a good coffee vault comes in handy like the Friis. Another difference comes in the form of the carafe, which is not the double-reinforced model that comes with the Cuisinart. This carafe is just your typical carafe that needs to sit on the heating plate to stay hot. Yet another difference with the Black & Decker CM5000B Mill & Brew that is a big thing with people is the color selection. With the Mill & Brew, you get to choose from up to four colors – grey, red, white, and black. 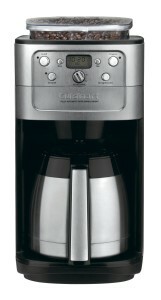 This only adds to the unit’s appeal, and puts it ahead of the Cuisinart Grind & Brew, which only comes in black. The cleaning on the Black & Decker is super easy, as the machine comes apart quickly and easily, and snaps back into place with little fuss. 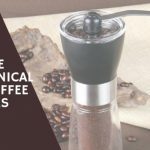 Surprisingly, the last thing we’ll mention here is that unlike the Cuisinart, which has only one grind setting, the Black & Decker actually has some grind flexibility. This is most welcome to those of us who like to tweak our grind settings in order to get a more specific grind that we want. 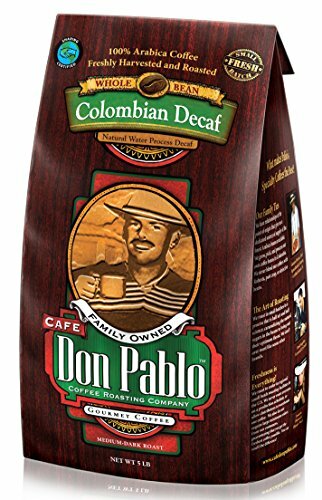 To coffee buffs, this is a huge deal! 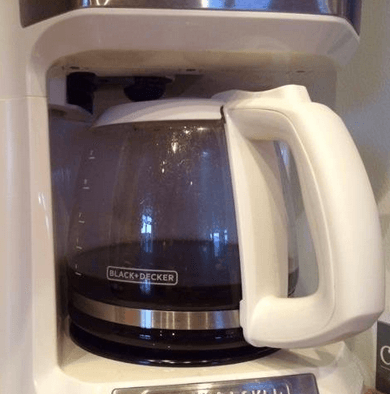 Its a tough call which machine should take the cake because the Black & Decker Mill & Brew does offer a lot of the same features (most, in fact), while also managing to look really sharp and be far more affordable than the Cuisinart Grind & Brew. Still, the Cuisinart has that all important burr grinder. 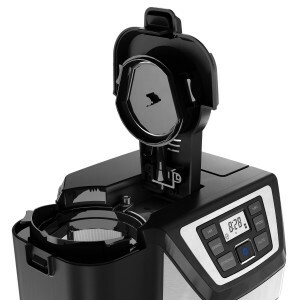 One weird thing about the Black & Decker Mill & Brew’s name is that it is called a “mill”, but there is no such thing as a coffee mill that uses blades. Just sayin’. In the end, we hope you choose the one you like best and are happy with the coffee you get from either of these two coffee maker grinder combo units! I have tried a few combo grinder-brewers and my major gripe is that many are set up so that steam from the hot water dripping into the ground coffee steams up the grinder and/or hopper because there is not a barrier that closes off the path from grinder to filter. I currently have a Cuisinart Automatic Grind & Brew coffee maker that steams up the bean hopper during brewing, leaving the whole mechanism and hopper damp. I refuse to leave beans sitting in a damp hopper, and drying out the grinder after every use is crazy. We stopped using this feature immediately and purchased a separte Cuisinart Supreme Grind mill grinder and add the ground coffee by hand each time from the plastic static prone hopper of the grinder (which causes ground coffee to cling and fly around—another serious design flaw). This two step process is a pain and it means that it takes extra time and hassle in the morning or requires leaving ground coffee in the filter overnight. Can you confirm that either of the two combo machines you review have remedied this stupid design flaw? I have lost faith in Cuisinart for the reasons described, and so am skeptical. First off I would like to say great blog! I hada quick question which I’d like to ask if you don’t mind.I was interested to find out how you center yourself and clear your mind before writing.I have had a tough time clearing my thoughts in getting my ideas out there.I do enjoy writing however it just seems like the first 10to 15 minutes are wasted just trying to figure out how to begin. Any ideasor hints? Cheers! Great and simple idea Bri!! Thank you! I recently got inspired by RealLiving( Australian home & lifestyle magazine) for DIY bed sheets dye project and it was great fun!! Looks amazing I must say and personal achievement and satisfaction is wonderful! 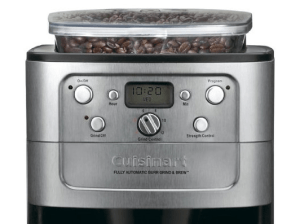 I’ve been doing quite a bit of research on these grind and brew coffee machines… the cuisinart has several options to choose from. the one indicated at the #1 spot was my first choice as well. until doing a side by side comparison of the stainless carafe vs the glass pot of the same model. the glass model clearly stated it has a built in BURR grinder. however the stainless carafe just states it has an integrated grinder. I purchased the glass pot option simply because it clearly stated it housed the burr grinder specifically, whereas the other models did not.